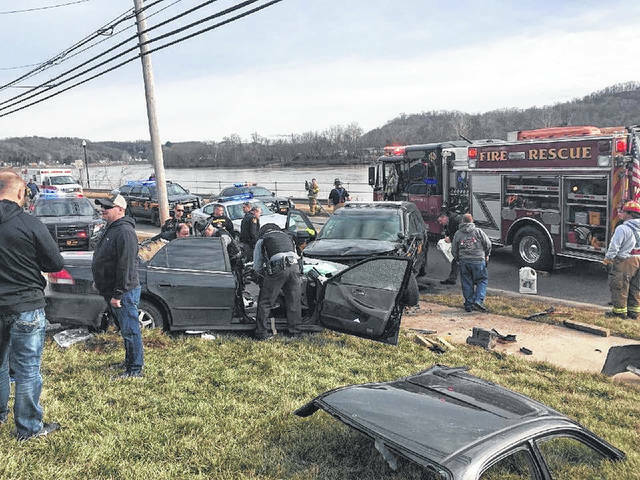 First responders investigate a suspect vehicle after extricating its victims on the 600-block of Pomeroy’s East Main Street, the result of a collision with a Meigs deputy. Law enforcement examine the site of a crash next to the Pomeroy Police Department after the suspect vehicle crashed with a Meigs Deputy’s cruiser. 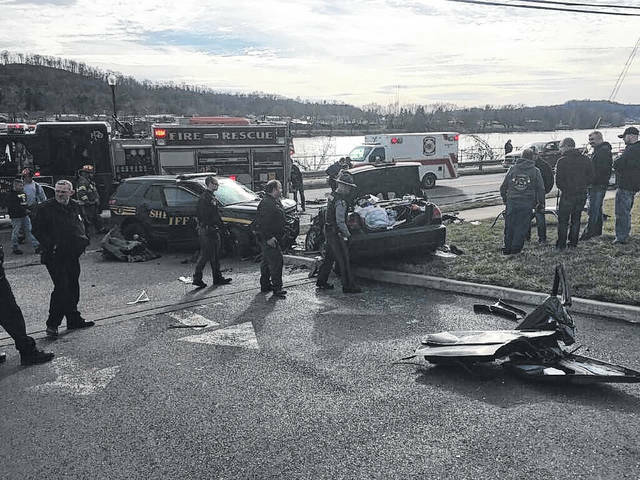 POMEROY — A Meigs County Sheriff’s Deputy and a suspect collided Wednesday afternoon as Ohio State Highway Patrol troopers pursued the suspect’s vehicle after it reportedly fled from a traffic stop. According to Ohio State Highway Patrol Commander Lt. Barry Call, first responders reacted to a crash in the 600-block of East Main Street in Pomeroy after a trooper initiated a traffic stop on U.S. 33, near mile post marker 2 in Meigs County. The suspect vehicle reportedly failed to stop and fled with the trooper in pursuit before it continued to drive into Pomeroy. According to law enforcement, the pursuit would eventually end with the suspect vehicle colliding with a Meigs Sheriff’s Deputy cruiser. A news release on Wednesday evening stated that the vehicle driven by Marcus A. Ervin, 27, of Canal Winchester, traveled at speeds in excess of 100 MPH on U.S. 33 onto Route 833 before turning on to East Main Street toward downtown Pomeroy. Officers with the Pomeroy Police Department intercepted the vehicle on East Main Street in an attempt to stop it, with the drive then taking the vehicle onto the sidewalk area which resulted in the collision with Deputy Ian Fennel’s cruiser. The Pomeroy Police Department neighbors Farmers Bank. The Meigs deputy was examined at a nearby emergency room for minor injuries and has been released. Ervin and his passenger, Keonjta Kuhn, 26, of Columbus, were medically evacuated by air to Ohio State University Medical Center after being extricated from the vehicle by the Pomeroy Fire Department. Neither had life-threatening injuries, according to Call, but they had some trauma that required close examination. Ervin’s vehicle, a 2002 Honda, received disabling damage and was towed from the scene.